ATG Group has won and began work on their first Scottish project of 2017. We were contacted by Heron Bros to undertake the submission of a working plan for the treatment and disposal/retention of material from the proposed site for the Arthurlie Family Centre in Auchenback, Barrhead, Scotland. Heron Bros required 9000m3 of soils to be excavated in order to reduce the levels for the building’s footprint. 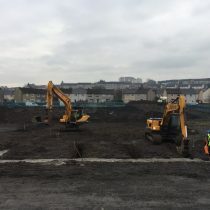 A quantity of soils on the site were also found to be contaminated with PAH’s, TPH’s and asbestos. ATG Group won the earthworks package (which included the contaminated soils) and the groundworks package for this project. Our solution involves treating the contaminated materials on-site and retaining them for future use. The 9000m3 of inert material will be removed to a suitably licensed facility at significant cost savings to the client. ATG Group has steadily expanded operations throughout the UK and Ireland. We’re now better positioned than ever before to offer expert solutions and cost savings on a wide range of remediation and environmental projects. 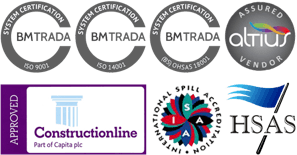 If you would like to find out more about what we could do for you, contact us, and we can put you in touch with one of our experts.